I always wanted a Parker Fly, and I also really liked the PM60. Last week the guitarist in my band (I'm also a bassist) saw a nice teal P-38 at Guitar Center for under $300, and bought it. Then he saw a Fender Roland ready Strat he wanted more, so I bought the Parker from him! It's not a Fly, but it's still a very cool guitar. AND it's mine. It's one of the Korean made P-38s. It has a nasty chip on the upper edge of the body, but otherwise looks new. I notice that bumping the vibrato arm while using the piezos sounds like a drum. I'm assuming that using some foam to darn the springs should fix that. I haven't tried it yet. But it's a great guitar and I love the neck! My next step is to replace the pickups. I don't use single coils because I hate hum. The humbucker is a bit dull and lifeless. Cranking the highs on the amp a bit makes the single coils too bright! Fortunately I'm a pickup maker so I'm going to make a new set (two single coil size dual blade pickups and a dual rail humbucker). Then at some point I'll replace the tuners with locking tuners, and I'm thinking about adding the Ghost Hexpander system and a 13-pin jack. 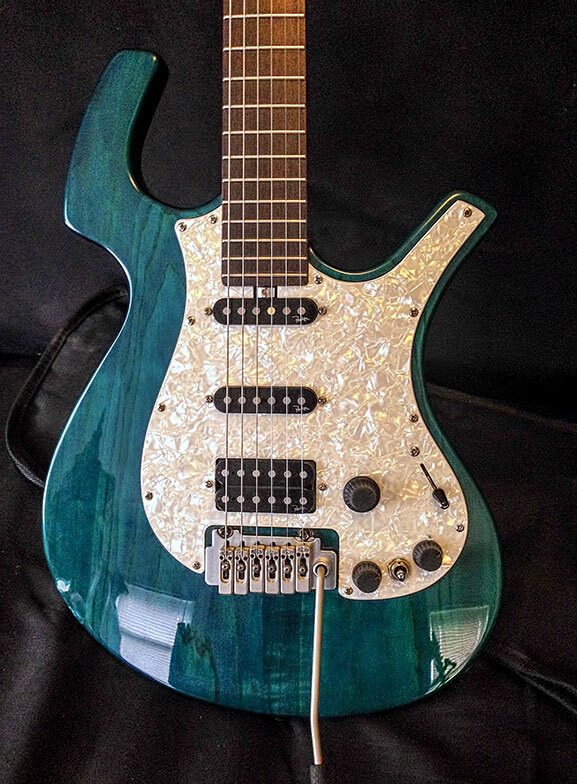 As an aside, this was one of guitars that Ken designed, which I like. Back in the mid 90s I got to meet Ken at a guitar building symposium. He was a real nice guy and we talked for over an hour. He gave me lots of encouragement and tips. Welcome to the Parker Forum DavidRavenMoon! Don't know much about P-38's but I like the color of yours. Really cool that you got to meet Ken Parker. Congrats! FWIW. My fly trem makes the same noise when using the piezo. Wow! It looks new and beautiful! Cograts! Thanks! It's a nice guitar. Obviously the Fly shape, but without the contours. 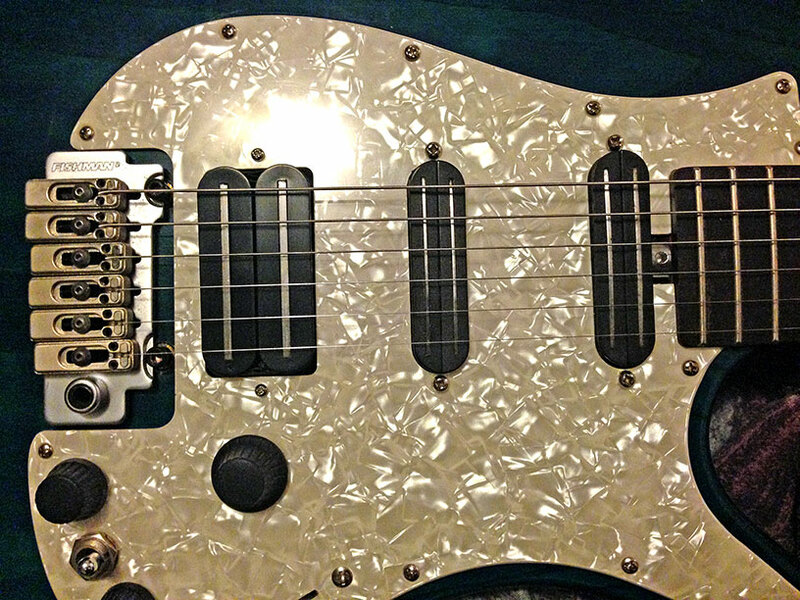 It has a bolt on maple neck with rosewood fingerboard, and a swamp ash body. No composite materials. The bridge is a Fishman Power Bridge, with the PowerChip preamp. It doesn't have locking tuners, but the generic tuners have shafts that look like Sperzels. The output jack is stereo, so with a stereo insert cable you get the magnetic and piezo pickups in each channel, ad with a regular mono cable they are combined. This is my first experience with a Parker, so I don't know if the Flys work the same way. I didn't like these bolt on models when they came out, but I fell in love with this guitar when I saw it. One of these days I'll own a real Fly. Here it is with new pickups. Wow, that's cool. How's the action on it? Don't give up the search for a fly. It's quite a different guitar. If you had the p-38 AND the fly you'd have a pretty far-reaching parker arsenal. Do you work for a pickup company or just build your own for fun?